It occurred to me today after our waterfall rappelling adventure that there are two types of adventure seekers; those who must look before they leap and those who prefer to take the leap without knowing where they are headed. I am the latter. 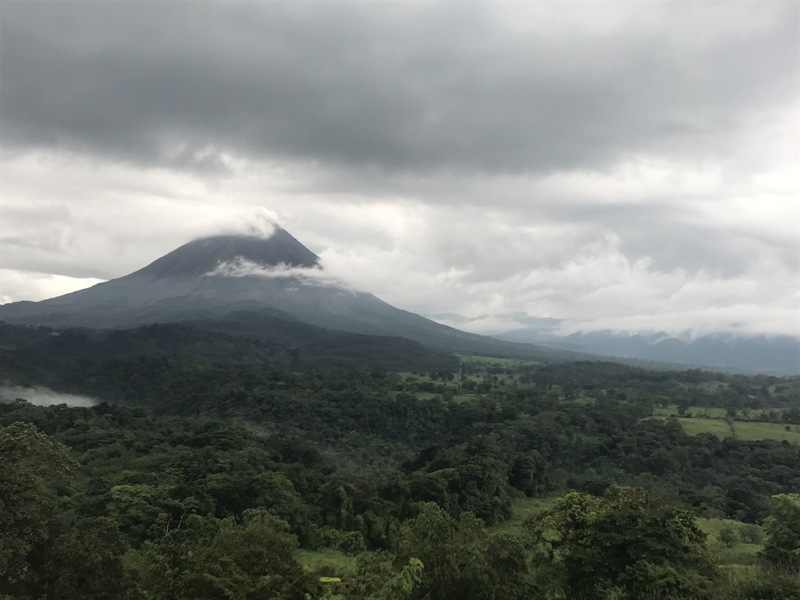 Before I get into that, allow me to describe the first part of the day here in the Arenal Volcano area. As suspected last night, our rooms have spectacular views of the volcano. Well, that doesn’t even begin to describe it! The volcano is literally staring us down in our hotel rooms! The morning views are truly majestic before the daily clouds settle in and cover it from view. I did a lovely yoga practice in my hotel room with the shades open so that I could enjoy the view of the volcano during my poses. There’s nothing like holding a downward dog pose while looking upside down at an amazing volcano as your drishti! Talk about finding your center! 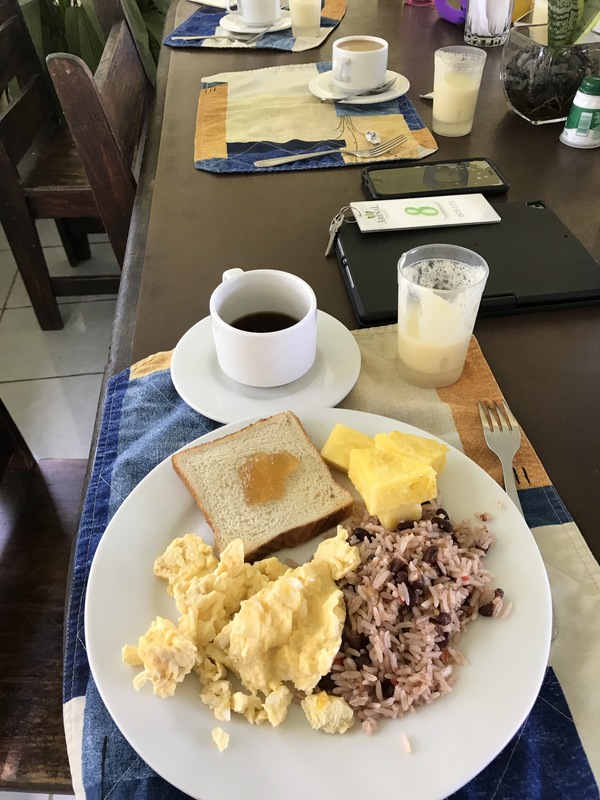 The group enjoyed a delicious breakfast of scrambled eggs, toast with pineapple jam, gallo pinto, fresh pineapple and a delicious agua fresca made with pineapple and guava. We definitely needed a hearty breakfast before our day of adventure seeking! No, I’d rather not see or know any of that in advance. The only thing I need to know is that others have gone before me and they have lived to tell about it. That’s it. On the flip side, you have adventure seekers who need to know EXACTLY what they are about to do. They watch intently. They walk close to the ledge to see the various dips, rocks and falls so that they can start making a plan. I think it’s funny that in all other aspects of my life, including travel, I research and plan for everything. In adventure pursuits, I just have to keep my eyes closed until the last possible minute. I’m not sure which type of adventure seeker is more common, but I definitely witnessed a good amount of both types today as we ventured together through the waterfalls. Our waterfall rappelling adventure was comprised of four water fall drops and one rope drop known as the “monkey.” The first drop was the highest. Once we conquered that one, the others seems like little hops down a water slide. Well, ok, not really. It was definitely a very fun activity and one that I won’t soon forget. I think the kids had a great time. It was unlike anything we can do in the midwest! There will be plenty of pictures to come in the coming days as one of our moms purchased the entire photo album from the guides. I can’t wait to see all the pictures! In a nutshell…No one got hurt. We heard a lot of screaming. A few shirts were ripped. Lots of water got up our noses. We were all drenched. The guides were funny and safe (and may guapo). The views were gorgeous. And finally, the memories were priceless. After waterfall rappelling, we had lunch. On the way to lunch, we stopped because our driver noticed a bunch of people taking pictures along the side of the road. In Costa Rica, that can only mean one thing; an animal sighting. Sure enough, there was a sloth in the tree. We all looked for it. It was really hard to see it. I think the picture of the kids looking for it is actually more interesting than the picture of the sloth itself. Hopefully, we will get a closer look at some sloths in Manuel Antonio National Park on Sunday. Lunch was a delicious casado (beans, rice, salad, root veggie purée, chicken) and papaya agua fresca. It was exactly what we needed after a long morning! We then traveled a few minutes to the Mistico Hanging Bridges park. The rain was starting, but that didn’t dampen our spirits as we went out on a 5 mile hike through the rain forest. We crossed nine hanging bridges during our hike. 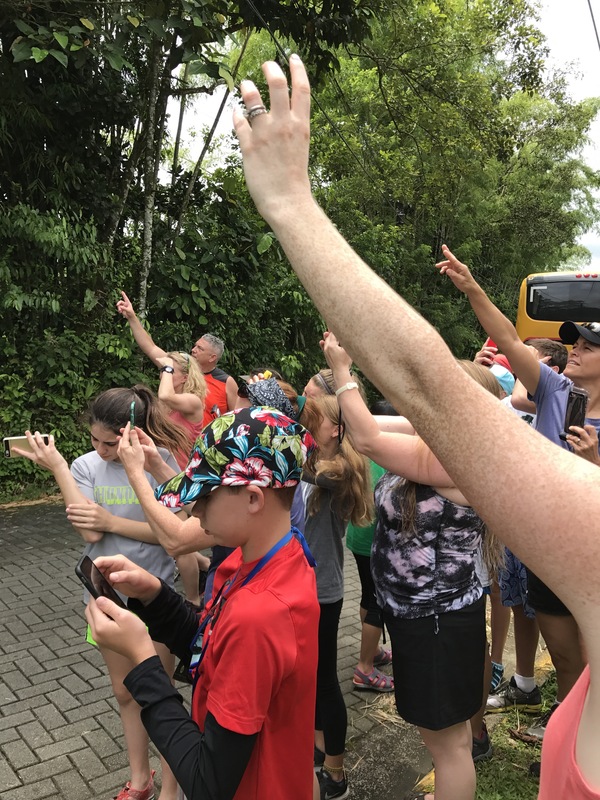 The rain stayed light so we were able to see many different types of plants and a few animals (one monkey, a tarantula, a snake and some leaf cutter ants). The kids were definitely ready to return to the hotel after our full day of activities. 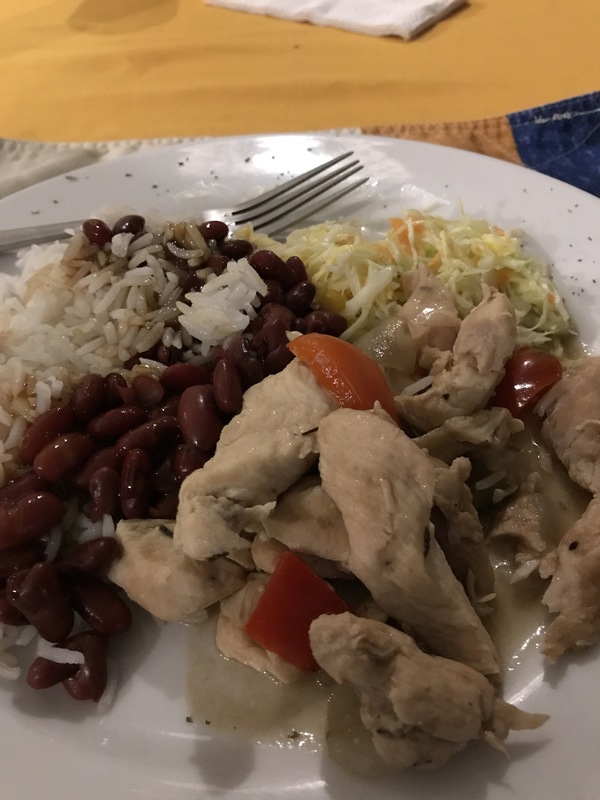 Dinner was chicken fajitas, rice, beans and salad. Yum! Tomorrow we head up the mountain to Monteverde!